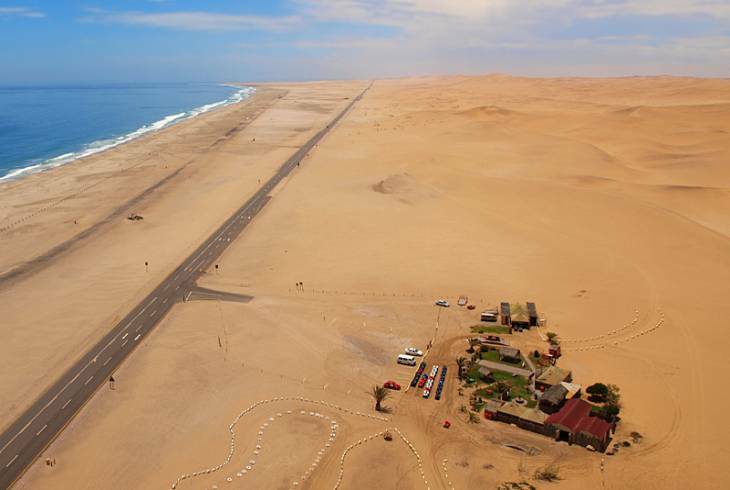 Long Beach, Namibia, is a 15-kilometre stretch of sandy beach situated on the Atlantic coast of the country half way between Swakopmund and Walvis Bay. The beach is sheltered from the prevailing southwest wind and storms by Pelican Point, a promontory behind which the harbour of Walvis Bay is situated. Long Beach has a gradual gradient into the surf and is safe for swimming. At the southern end of Long Beach a small resort has gradually developed sporting a jetty and promenade, picnic spots and a restaurant. A small cluster of houses has been built here. Long Beach is a truly wonderful beach to visit. It is wild and uncluttered by tourists. The view from the beach is one of unbroken sand dunes stretching as far as the eye can see. Sunsets seen from the beach can be really magnificent. Bird lovers may be lucky to see the rare Damara Tern, which breeds and roosts in the area. Long Beach overview. Long Beach Accommodation and Information.